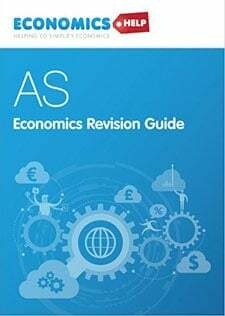 Summary – If a country has a higher inflation rate than its competitors, then its good will be increasing in price at a faster rate and therefore, they will become relatively less competitive. It will experience less demand for its exports and therefore less demand for its currency. This will tend to cause a depreciation (fall in value) of the currency. 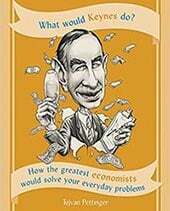 Readers Question: It is my understanding that targeting takes precedence over more tangible (and important) factors such as unemployment, growth and balance of payments (imports keep a lid on inflation and helped create Britains ‘NICE’ decade). You can understand this as the threat of stagflation of return is very real and visceral. However, with ‘free’ floating international exchange rates I question targeting’s relevance. Exchange rates reflect the competitiveness of a country and although there are obviously countless other problems associated with inflation as long as exchange rates respond to any changes in the price level a countries trade balance should not be adverse. What is your opinion on the relationship between exchange rates and inflation and whether this is natural market reaction could stem future inflationary problems? Inflation targets can help reduce inflation expectations and make it easier to keep inflation low. Inflation has various economic costs. Keeping inflation low helps to encourage economic stability and investment. However, the 2008-13 recession has made quite a few economists question the importance we give to inflation targets. Headline Inflation has not been a good guide to the underlying output gap. e.g. temporary cost-push inflation has pushed inflation above the target, e.g. in at the start of the recession, inflation was 5%. 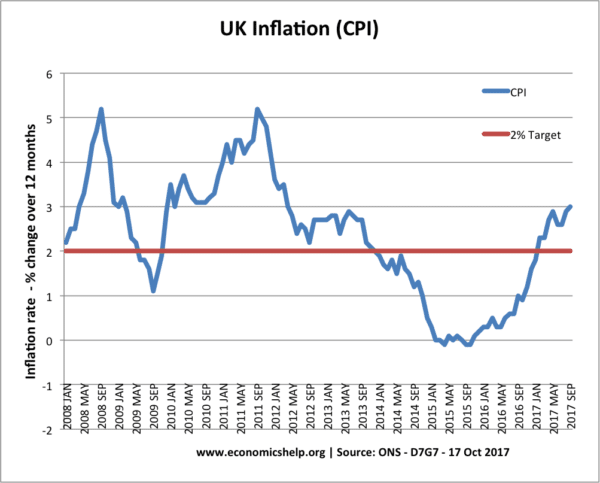 Arguably, wage inflation would have been a better guide to underlying inflationary pressure than the rather misleading CPI and RPI stats. The costs of mild inflation appear very insignificant compared to the much greater social costs of unemployment and recession. Arguably an unwarranted fear of inflation has prevented Central Banks (especially in Europe) from pursuing sufficiently expansionary monetary policy. Rigid inflation targeting has caused the real threat of debt deflation and a stagnant economy. Theoretically, if a country is running a current account deficit, this is likely to cause a depreciation in the exchange rate. During 2007 and 2008, we see a significant depreciation in the value of the Pound. 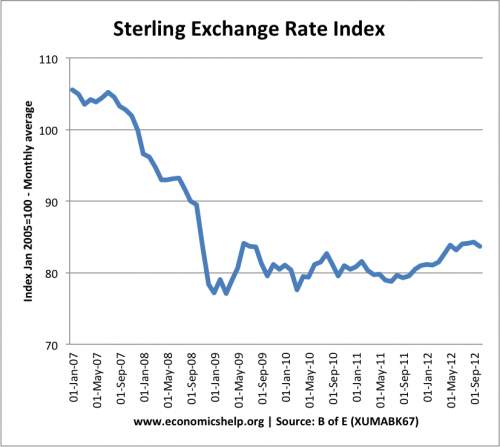 This shows Sterling exchange rate index (against the main basket of trading partners). This 20% depreciation in the exchange rate should, in theory, cause inflation. However, the inflation proved very temporary because the recession of 2008-09 put downward pressure on prices and overrode the impact of depreciation. The MPC did later blame the delayed impact of depreciation for some continued import price inflation, but generally, the depreciation didn’t really cause any significant inflation. 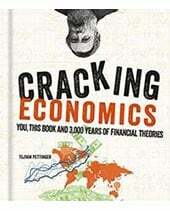 If the economy had been in a boom, then the inflationary impact of depreciation would have been much greater. However, the UK’s experience shows that you can devalue (depreciate) the exchange rate without allowing inflation becoming a significant problem. 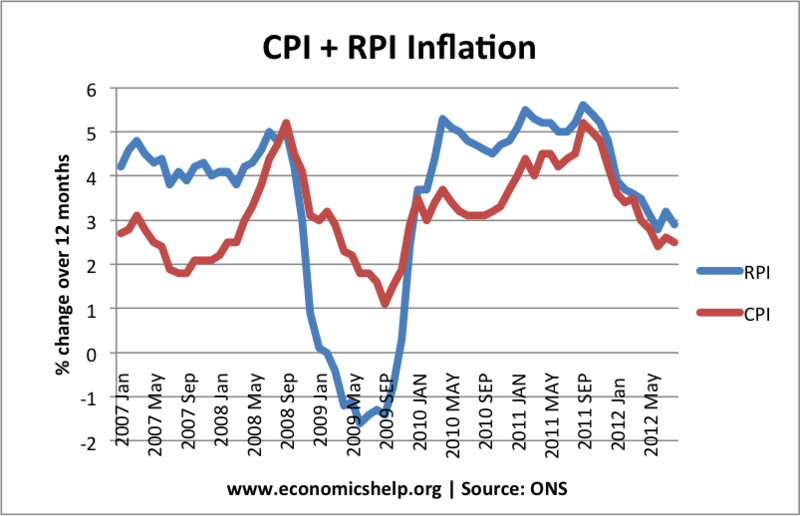 At the moment, I still think underlying inflationary pressures in the UK are limited. Real wages are falling; nominal wages are almost stagnant. Therefore, in this climate of weak wage growth and a negative output gap, a future depreciation would only have a limited impact on inflation. It is not something that should make policymakers move away from their real target – which at the moment should be reducing unemployment and increasing economic growth. 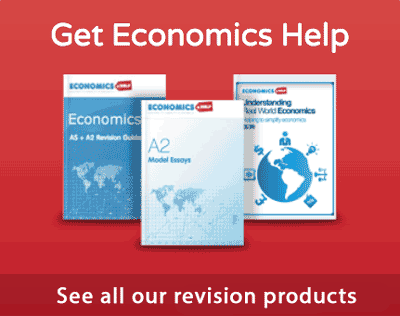 Did the depreciation solve the Current account deficit? Again, theoretically, you would expect a 20% depreciation in the value of the Pound to improve the current account. Here the evidence is mixed. 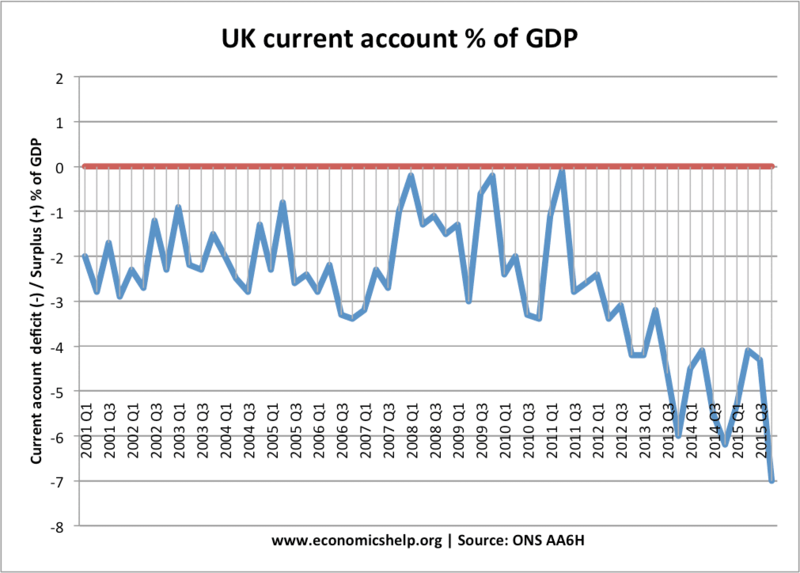 At the start of 2008 and 2011, we see a rapid improvement in the current account – partly a reflection of the depreciation and partly due to falling spending on imports. 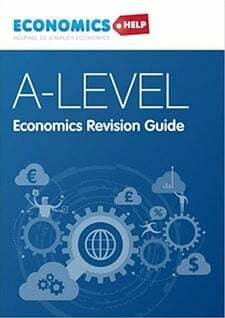 This entry was posted in A-Level, economics. Bookmark the permalink.